Birdwatchers from around the region have been alighting in Hopwood for the past month, hoping for a glimpse of a great grey shrike. 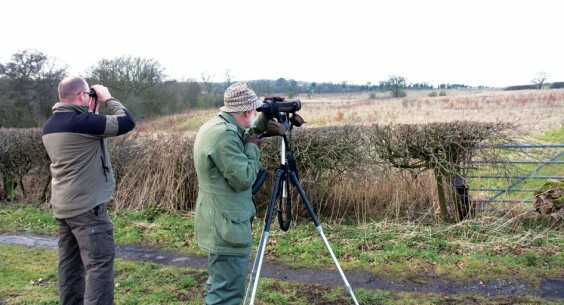 Twitchers were first alerted to its arrival by the Rare Bird Network on December 20, since when huddles of people with high-powered lenses have been a common sight on the road between Alvechurch and Hopwood. The shrike has settled on the land where thousands of tree whips are establishing “Mick’s Wood”, creating ideal conditions for it to perch on bare twigs, surveying the landscape. About nine inches high, it is known as the “butcher bird” for the way it catches smaller birds and rodents and then impales them on barbed wire or thorns, where it can strip their flesh. Its Latin name, Lanius excubitor, translates as “butcher sentinel”. 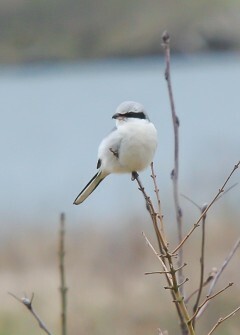 The Hopwood shrike could stay until late March, so sightings of twitchers along the B4120 are likely to remain common. The picture of a great grey shrike on our cover (and right) was taken by Wythall wildlife photographer Ashley Grove, whose images can be seen and bought at The Village Greengrocer in Alvechurch.